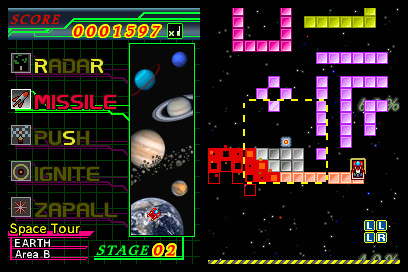 Flametail began life as the "Square" bit of the rather unique WiiWare release MaBoShi: The Three Shape Arcade. Instead of a straight port of the game, the developers chose to not only give the game a nice little visual facelift but also a host of new gameplay twists and options to add to its depth. Oh, and it's (obviously) portable too, which is a great place for a puzzler to be. The basic premise of Flametail remains much the same as it did in Maboshi. 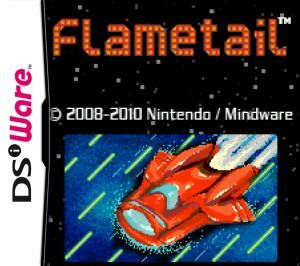 You take control of a Flametail and must move around the screen, touching blocks strung around the field in order to torch and destroy them before the incoming hazard line overtakes them. While this starts off quite easy, you'll soon find the block layouts quite tricky and challenging to maneuver. Luckily the game does toss you a host of power-ups that range from a Bomb to destroy large chunks of blocks inside the destruction field, to a Missile that you can fire off in front of your ship to help clear the way. There's even a Radar function to give you a full view of the field around you, something that will make navigating some of the trickier levels much easier. There are two modes to choose from in Flametail. Space Tour is the main portion of the game and will likely draw the most of your playing time. You'll travel to a host of different planets, each with their own set of challenging levels to take on. 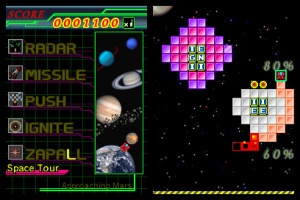 While these levels start off quite easy, as you move on to later planets, you'll soon find the difficulty ramping up on you and the power-ups becoming a much more integral part of the equation. If you're looking for a change of pace, the game also offers up a Time Limit mode where you take on various levels in a race against time. Your ultimate goal is to score as many points as possible within three minutes. 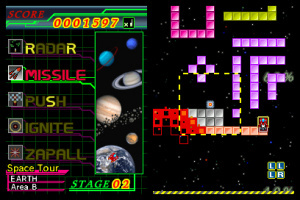 There are even different types of levels that feature varying level themes to even further mix the gameplay up, not to mention even more Time Limit levels to be unlocked via Space Tour mode. It's difficult to not be impressed with just how far the developers have been able to stretch such a simple and basic gameplay design. While this fairly straight-forward play control system might come off a bit bland to those looking for something a bit more flashy and intricate, those who can appreciate its simplicity and addictive nature will certainly get a kick out of the game. And with the extremely smooth and responsive play control system, there's no one to blame but yourself when you find yourself once again staring at the Game Over screen for the countless time. It's nice to see the developers spice things up from an audio/visual standpoint from the rather plain look and sound of the original Maboshi release. Not only are the backdrops quite a bit more vibrant and detailed, but the musical presentation is also quite a bit more polished. There's even a really cool digitized voice that announces the Letter Blocks you pick up. As superficial as these changes might seem on the outside, you'd be surprised at what a world of difference they make in the finished product's overall aesthetic appeal. Flametail succeeds in taking the very simple gameplay idea of Maboshi's Square puzzler and turning it into a very enjoyable stand-alone package. The visual upgrades offer a much more enticing presentation this time around and the new gameplay introductions only further add to the overall experience. Puzzle fans who can appreciate something simple yet unique will likely find a lot to like about Flametail and there's even enough new twists to make it worth buying for those who already own Maboshi. That being said, if you didn't care for the game in the WiiWare release, there's probably not enough new here to sway you. I'm one of the weirdos who liked Square the most out of the MaBoShi games (Most say it's the worst part) but I'm not sure if I liked it enough to warrant buying a 500 point portable version. 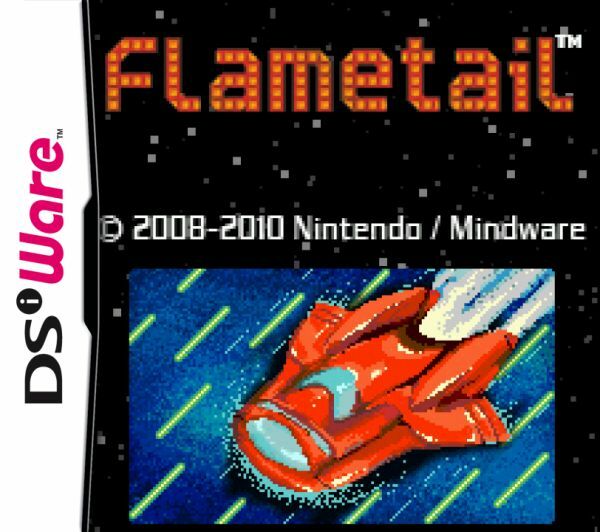 It is a very nice game and one of the first Japanese DSiWare games I downloaded. Good review, but that tagline is terrible! I love MaBoShi, but always found Square to be the most difficult part in terms of racking up points. Perhaps this can help me improve my core Square skills and then take it on again. So far I've only reached 1 million points in Circle. The music really is awesome; some of it reminds me of the tunes from Namco's late 80s games, specifically Galaga '88. This one's a 6/10 for me... Gameplay mechanics are a little off, and having to use the control pad as a select button is just plain weird. Anytime I have to turn the DSI sideways to play a game it just throws me off totally. Otherwise, a good effort, colorful, interesting, fun, but part of me feels like it could have been a little more... Good game for the points, tho.